A must for all airsoft rifles. This is the most important accessory for your airsoft weapon, you must treat your airsoft gun as a real weapon. This rifle bag will fit guns like the AK47, M4/M16, MK36 and more. It can also fit spare magazines on the side where you can put them into the molle pouches. It also has compartment for 2 extra hand guns. Regular retail value is around $150. Similar carrying devices by other leading brands are probably not as good as this one but they will cost you over $200! This is so far one of the best rifle case you can find at the best value ever. We guarantee you that you will like it! I personally like it the most because it looks and feels just like some of the leading brands such as so-tech and Blackhawk, but at a fraction of the price! You won't find another rifle bag this nice at this price anywhere else. Attention all airsoft and paintball players, it is illegal to brandish your replica guns in public. Please always transport them in a carrying or storage device. If you do not have a rifle bag yet, you need to get one now! 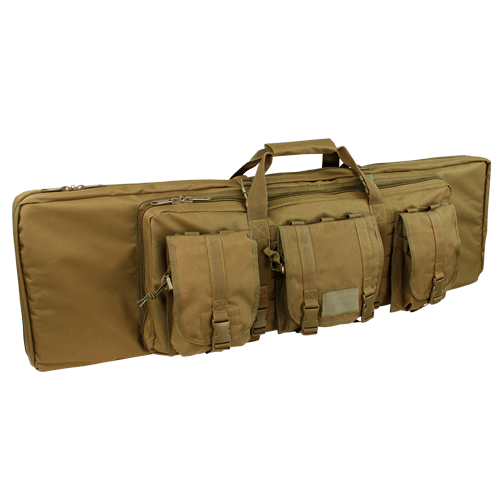 It is the perfect rifle bag for your Tokyo Marui, ICS and Classic Army AEG. Please make sure to purchase a rifle bag for your airsoft weapon.